Floodlights were installed and on 30 October 1957, they were switched on for the first time for a match against Everton, to commemorate the 75-year anniversary of the Liverpool County Football Association. In 1963 the old Kemlyn Road stand was replaced by a cantilevered stand, able to hold 6,700 spectators and built at a cost of £350,000. Two years later alterations were made at the Anfield Road end, turning it into a large covered standing area. The biggest redevelopment came in 1973, when the old Main Stand was demolished and a new one was constructed. At the same time, the pylon floodlights were pulled down and new lights installed along the top of the Kemlyn Road and Main Stands. The new stand was officially opened on 10 March 1973, by the Duke of Kent. In the 1980s the paddock in front of the Main Stand was turned into seating, and in 1982 seats were introduced at the Anfield Road end. The Shankly Gates were erected in 1982, a tribute to former manager Bill Shankly; Shankly's widow Nessie unlocked them for the first time on 26 August 1982. Across the Shankly Gates are the words You'll Never Walk Alone, from the Gerry & The Pacemakers' hit song that Liverpool fans adopted as the club's anthem. Coloured seats and a police-room were added to the Kemlyn Road stand in 1987. After the Hillsborough disaster in 1989, the Taylor Report recommended that all grounds in the country should be converted into all-seater grounds by May 1994. A second tier was added to the Kemlyn Road stand in 1992, turning it into a double decker layout. It included executive boxes and function suites as well as 11,000 seating spaces. Plans to expand the stand had been made earlier, with the club buying up houses on Kemlyn Road during the 1970s and 1980s. Plans were put on hold until 1990 because two sisters, Joan and Nora Mason, refused to sell their house. When the club reached an agreement with the sisters in 1990, the expansion plans were put into action. The stand was officially opened on 1 September 1992, by UEFA president Lennart Johansson and re-named the Centenary Stand. The Kop was rebuilt in 1994 after the recommendations of the Taylor Report and became all seated; although it is still a single tier, the capacity was significantly reduced to 12,390. Liverpool did not lose a league match at Anfield seasons 1893/94, 1970/71, 1976/77, 1978/79, 1979/80 and 1987/88. 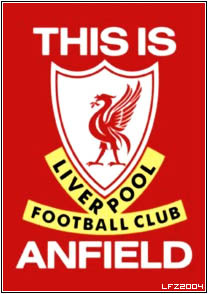 Liverpool won all their home games in 1893/94.